11 year old Fahriddin Farruhzoda is deceased with encephalic apoplexy. He cannot move independently and wheelchair got broken five years ago. His parents are not able to afford new one. - My son needs gradual and constant treatment – Rahbaroi Yuldosheva, the mother, says. – He needs treatment every three months – massage, vitamins. Each treatment costs at least 200 US dollars. I have very low salary. Nobody helps us. We dot even see humanitarian aid, provided by international organizations. We have not seen our local administration representatives for five years. The teacher visits Fahriddin on Tuesdays and Fridays. The lesson takes only 1 hour. We are not satisfied with that – the mother continues. – We want our son to go to secondary school with other kids or at least school for children with special needs. We have none in Sogd oblast. - Every child has a right for education – Svetlana Abdullaeva, the representative of Rehabilitation center for disabled children in Hudjant, says. – The special groups must be formed for such kids in the secondary schools. There is valdorf school in Hudjant that provides equal education opportunities for all kids. The public task is to increase the number of such schools. We need to prepare defectology experts, speech therapists, international sign language interpreters. We do not have any single trainer, working for kids with physical disabilities. We do not teachers, working for kids with mental problems. These functions are performed by ordinary school teachers in Sogd oblast. According to official data, two thousand special needs children were registered in Sogd Oblast in 2008 while in reality there are five thousand disabled kids. Makhina Usmanova, the department of education expert in Sogd oblast, informed Ferghana.Ru that, today, there are four boarding schools in northern Tajikistan that educate 411 special needs children. 84 teachers are employed in this system. Independent expert Kamari Akhror says that this is barely enough to provide education to 4.5 thousand children. At same time, Mukhabbat Djuraeva, the head of the Center for medical and pedagogical consulting, notes that the number of Center visitors has been growing over the last few years. Officially, there are 750 disabled children in Isfara rayon. However, only 43 of them get medical, psychological and pedagogical consultations in the municipal clinic under UNICEF-funded project. Today, none of higher education institutes in Tajikistan prepares defectology experts. The only department at Dushanbe state pedagogical University was closed in 2006 due to "unprofitable results". - We need to bring back Soviet practice when secondary school teachers were compensated 25 percent of their salary for the work with special needs children – Svetlana Abdullaeva says. – This will motivate the teachers. According to one teacher of secondary school #24 in Kanibadam, the Education Ministry decree cancelled 20 percent salary incentive for teachers, educating children at their homes. - Last year we monitored "The observance of rights for access to education for disabled kids in two special-purpose institutions and schools of Sogd and Hatlon oblasts in the Republic of Tajikistan", Nigina Muminova, the head of Amparo Association of Young Lawyers NGO in the city of Hudjant, says. – It demonstrated that there are serious problems in the country that create additional difficulties for such kids. The legislation does not clarify the status of "special needs children" and this has to be done in accordance with international standards. The government must provide all necessary special equipment, instruments, facilities, areas and buildings for disabled children. Nurinisso Kamilova, the head of Social Security Department in Sogd oblast, says: all disabled children are offered 54 somoni (14 US dollars) allowances. By the order of oblast administrator, 258 kids were offered one-time help, designated for buying medicine. The rest privileges, which existed before, were cancelled by the deputies of the parliament. There is new draft law under consideration and we hope the privileges will be restored. According to Shoira Buzukova, the expert in the Healthcare Department for Sogd Oblast, 4379 kids were registered in 2007 while in 2008 there were 4536 special needs children. In 2009 we conducted physical examination of 623 thousand schoolchildren and kids – Fahriddin Hakimov, chief pediatrician of Healthcare Department of Sogd Oblast says. – The results indicated that 0.4 percent have problems with ears while another 0.5 percent have problems with eyes. Mr. Hakimov mentioned that Oblast children’s hospital and Republican physio-therapeutic health center in Hudjan offer free treatment for disabled children. The most challenging problems, faced by disabled kids, are social ones – Shahlo Sobirova, the lawyer, highlights. – The legislation of Tajikistan assumes free supply of medicaments, wheelchairs, other technical equipment and even free treatment. Nonetheless, these norms are not observed. Sixty somoni (16 US dollars), compensated to such kids, is nothing. 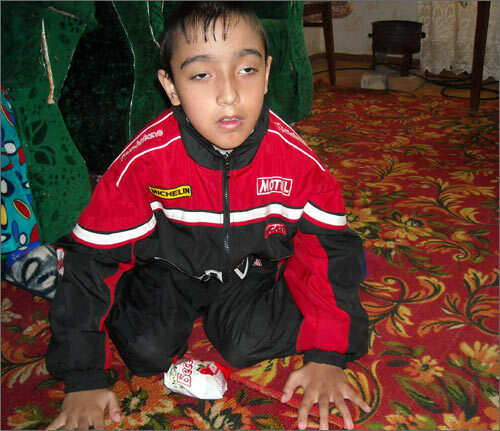 The government of Tajikistan must adopt social program to improve the life of disabled kids. Moreover, I believe it is necessary to attract international organizations to focus on this matter. When I visited the family of Yuldashev, I asked Fahriddin to read the poem. He was very happy to read very simple one. If he had the opportunity to communicate with peers and teachers he would definitely learn other poems. Fahriddin is eager to walk, play, sing songs, read poems and chat with other kids.